There’s nothing a practising Muslim ever does without the invocation: “Bismillah ar-Rahman-ur-Rahim” (In the name of Allah, the Most Compassionate, the Most Merciful). About Prophet Mohammed he will tell you that Allah sent him to earth as “Rahmat-ul-Alemeen” (mercy on all mankind). The very word Islam means peace, you will be told. Allah, Prophet Mohammed, Islam is all about peace, compassion, mercy. Get it? Firstly, India must strongly oppose America’s continued military occupation of Afghanistan and also condemn its drone attacks on innocent civilians in Pakistan. It is high time we Indians realised that the US has aided the rise of religious extremism in Pakistan both by supporting the Taliban covertly in the 1980s, and also by fighting it overtly now. Indeed, America would do itself good by leaving Afghanistan, Pakistan and India to manage our own affairs, and resolve our own disputes. Moreover, today’s economically weakened America has no stomach for prolonging its unwinnable war in Afghanistan. Therefore, here is an opportunity for India to play the role of a benign leader in South Asia, by winning the confidence of the peoples of neighbouring countries. India’s ability to play the leadership role, and thereby establish a new design for a secular, democratic and cooperative South Asia, critically hinges on early resolution of the Kashmir dispute. The longer Kashmir remains strife-torn, the more oxygen it will provide to religious extremists in Pakistan and also to anti-India sections in its armed forces. Therefore, there is an urgent need to intensify efforts in India for a national consensus on resolution of the Kashmir dispute. The third bold idea is to unleash the power of Indianised Islam to bring the Muslims of India, Pakistan and Bangladesh into a closer fraternity, not as a dominant or separate community enjoying exclusive rights and a privileged status over others (such as is given by the blasphemy law in Pakistan) but as an equal member of a secular, multi-religious subcontinental family. This calls for a new confederal constitutional arrangement between India, Pakistan and Bangladesh, in which the three countries remain sovereign and yet adhere to the common principles of justice, secularism, democracy and protection of minorities in their territories. In other words, Pakistan and Bangladesh must be re-absorbed and re-integrated into the Idea of India, with this important recognition that Islam is as much a part of the idea of India as Hinduism and other faiths are. The threat posed by the TTP is difficult to counter because of the conceptual confusion within Pakistan’s establishment. The TTP is not a homogenous group, but an umbrella organization which allows militants or breakaway factions from a large number of organizations to share resources including manpower to carry out their ideological battle. Although belonging to various religious schools of thought, the militants are inspired by the Muslim theologian Ibn Taymiyyah’s philosophy of waging war against the non-Muslim world and using violence against Muslims who do not agree with a fundamentalist interpretation of Islam. However, the takfir ideology has spread among other militant groups, which has allowed some militants to break away from parent organizations and merge into the TTP. The TTP believes in waging jihad even against Muslims who help non-Muslims or do not fight un-Islamic rule. Such a belief compels them to wage war against Pakistani forces, as they are considered to be toeing the U.S. line and fighting a war that is not Pakistan’s. Pakistan has many more drones than America. These are mullah-trained and mass-produced in madrassas and militant training camps. Their handlers are in Waziristan, not in Nevada. Like their aerial counterparts, they do not ask why they must kill. However, their targets lie among their own people, not in some distant country. Collateral damage does not matter….. Very few people realize that a total of 14 Americans (al-Qaeda’s original enemy), got killed within Pakistan since 9/11. These included twelve American servicemen, Daniel Pearl (journalist) and a diplomat…. The BJP on Sunday alleged that the inclusion of RSS leader Indresh Kumar’s name in the Ajmer blast chargesheet was a political conspiracy hatched by the Congress. The Congress, on the other hand, asked the saffron party to reflect upon the involvement of people belonging to the Sangh Parivar in terror acts. It said the disclosure has not come as a surprise. 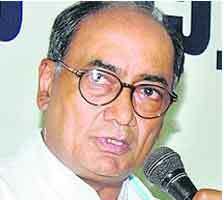 AICC general secretary Digvijay Singh, who was the first to raise the issue of saffron terror way back in September 2008, said the disclosure was nothing new and that Kumar had been a key strategist behind all terror incidents. General Jim Jones, the National Security Advisor who resigned recently, is quoted as telling President Asif Zardari: “If, God forbid, Shahzad’s SUV had blown up in Times Square, we wouldn’t be having this conversation. The president [ Obama] would be forced to do things that Pakistan would not like… No one will be able to stop the response and consequences. The point is the talk itself. War may not happen, for conditions do not allow it, but talk of war very nearly serves the purpose of those who would like to see it happen. In short, war is best, but talk of war is a close second. Such talk, from whichever perspective, helps build a siege mentality among an unsuspecting public. Whether you listen to arguments for or against, just the fact that you are listening to serious war talk all around you makes you feel you are, or soon could be, at war. And that opens you up to the idea of supporting the purchase of another aircraft bomber even if you can’t pay your mortgage instalment. From the 19th century onwards, Hindu nationalists have argued that retaliatory violence is a legitimate form of dealing with the ‘enemy’. In doing so, they argued that in order to protect dharma, which was conveniently translated as religion, Hindus needed to resort to violence when required. The question of the legitimacy of resorting to violence was always arbitrary. The failure of the recent talks between the External Affairs Minister S. M. Krishna and his Pakistani counterpart Shah Mahmood Qureshi has been attributed in part to GK Pillai’s statement that the Inter Services Intelligence Directorate was involved in the 2008 Mumbai operation from the beginning to the end. Mr Pillai does tend to misspeak, and you can question the timing of his statement. But surely there is something bizarre about taking umbrage to his timing but not what he said. And what he said is indeed sensational. If an agency of the Pakistan government was involved in the Mumbai attack, why is India bothering to talk peace with that government? The Indian government’s policy works on the belief that there is a tussle between the civilian and military wings of the Pakistan establishment, and that it is in India’s strategic interest to back the civilians so as to forever marginalise the self appointed guardians of the Islamic Republic— the Pakistan Army. TIMES NOW acquires transcripts of a conversation between hard-line separatists and mobs, exposing how they are trying to instigate violence in the Kashmir valley. 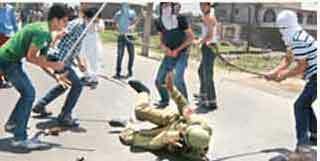 The role of the hard-line faction of the Hurriyat has been exposed. TIMES NOW has acquired transcripts of a conversation between Hurriyat Geelani faction leader and his paid activist. The conversation very clearly exposes how the hard-line separatists are trying their best to instigate violence during the protests. The Hurriyat Geelani faction leader is heard instigating his activist to ensure that at least 10-15 people are martyred. Hurriyat (G) leader Ghulam Mohd Dar: I heard there is a protest march in Budgam. Local Hurriyat activist, Shabir Ahmed: Where? Shabir Ahmed: I believe one small one had. Where will they go right now? Ghulam Mohd Dar: I swear, 30,000 of them. Protest near the Magam Forest check post. You enjoy your salaries without doing anything for it. Ghulam Mohd Dar: We want 10-15 more martyred. Did you hear that?